Hello people! Windows Hive is back with CONTEST again. Last time we hosted contest for Lumia640XL. This time we are going to give away two brand new Lumia 540. 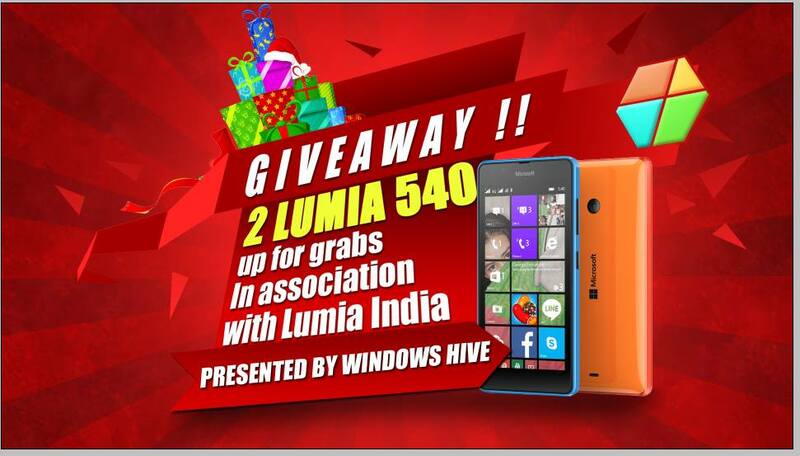 In association with Lumia India we are going to host this two give away. One of the the give away is tomorrow so get ready to play with us and hold a chance to win the brand new Lumia 540. You Might be wondering what are the rules? This is simple! The organiser reserves its sole rights and discretion to delete, remove, not consider or reject the entries with content that is deemed improper or offensive in what ever nature. Any entries from profile(s) that seems dubious will be rejected and shall be liable for legal actions. The contest will be held on 29/05/2015 from 5:40 PM IST to 5:40 AM IST on 30/05/2015 . Only the answers in this time frame are considered. For this contest only one Lumia 540 and there will be another contest soon. More details to follow soon. Till then stay tuned! We wish you best of luck for the upcoming contest. Hope to see you playing with us! Show us your excitement in the comments below!